Add Curb Appeal to Your Home - Columbia Builders, Inc.
Take these tips to mind when trying to squeeze some more curb appeal out of your property. Springtime is the right time for sprucing up the exterior of your home. Enhancing the curb appeal of your home can add value and simply make driving up to your home each day a little bit brighter. An inviting and welcoming exterior leaves a lasting impact and will boost everyone’s first impression of your home. So, whether you are considering a sale, or just want to tidy up after a long winter season, here are a few ways to make your home stand out. A fresh coat of paint on your front door can really make the exterior of your home strike the right chord. Whether you choose a coordinated neutral hue or really want to make it sing with a pop of color, painting your front door will give instant life to your exterior. If your door is dated or in need of repair, consider going further by updating the hardware, or replacing the door entirely. If you elect for a new door, take the time to choose a door that compliments the style and façade of your home. An inviting and welcoming exterior is a well lit one, allowing you and your guests sure footing no matter the season. Depending on the age of your home, pay close attention to the scale of your exterior lights. Often, they are smaller than they should be to properly illuminate your walkways and doors. Swap those small fixtures out for larger pendant style lighting, and consider other options such as up-lighting, solar landscape lighting, and a well-placed lamp post to bring warmth to your home after dark, and increased security as well. 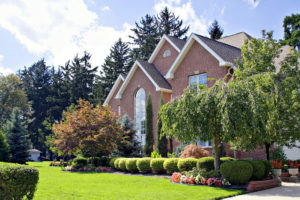 Tis the season – it’s time to address your landscaping! From trimming, pruning and mulching, you’ll want your trees, shrubs and beds free of debris and ready for new plantings. Even if you prefer to keep your front landscaping as maintenance free as possible, add a few punches of brightly colored annuals (when safe to plant after the last frost) to brighten up your yard. A few strategically placed planters near your front door, on your porch, or even at the beginning to your walkway, welcome all who enter your home. If you’re lucky enough to have a front porch that is large enough for a seating area, treat it as an extension of your living space during the warm weather months. Even a small porch adds much to the exterior of a home with chairs, a table, and chair cushions or pillows. Right now, home centers and discount retailers are filled with easy care options in colors sure to compliment your home. With blooming plants nearby and a cool drink in hand, your porch could become everyone’s favorite spot. A sharp eye will find faded house numbers, a mailbox that is past its prime, a driveway that needs sealing, a house that needs power washing or painting. The last step to make the most of your home’s exterior is to identify those little details that are often inexpensive DIY projects but go a long way to add curb appeal – and add a welcoming feeling to your home! If you’re ready to invest in a home that is built with your needs in mind, trust in us. Give Columbia Builders a call today at 410-730-0215 or use our contact form here. You can also keep up with us on Facebook, Twitter, Houzz, and Youtube, and don’t forget to check back on our blog for more tips and information! 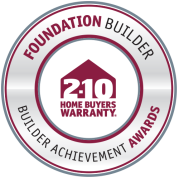 Columbia Builders is has been recently recognized with the lifetime achievement Foundation Builder Award as part of the 2018 Annual Builder Achievement Awards Program through 2-10 Home Buyers Warranty. In addition to providing insurance-backed structural warranties, 2-10 HBW recognizes builders with a long-standing tradition of providing exceptional customer service and protection to their home buyers. The Foundation Builder Award is reserved for builders who have demonstrated a steadfast commitment to improving the housing industry. We are honored to have received this award! This entry was posted on Thursday, April 4th, 2019 at 10:25 am. Both comments and pings are currently closed.